Braces or Invisalign Clear Braces in Fairfax VA? Are you in the middle of weighing the pros and cons of getting braces or Invisalign® clear braces? Well, you’ve come to the right place! Our cosmetic dentist, Dr. Riaz Rayek, compares braces and Invisalign to help you learn more about each orthodontic option. Invisalign has the power to correct the following dental conditions: severely crowded teeth, widely spaced teeth, underbite, overbite, and crossbite. It only takes a few weeks to begin to notice a difference with Invisalign. Treatment time varies from patient to patient, however, average treatment time is 11 months. The aligners are clear and practically unnoticeable. Invisalign Express® is available for patients who do not have significantly crooked or misaligned teeth. This option is also great for patients who already had braces and their teeth re-shifted slightly into a misaligned position. Patient compliance is critical since the clear aligners must be worn for 20-22 hours every day. Patients do not have to abstain from certain foods– keep eating your favorite foods with clear braces! The aligners are comfortable, and patients won’t experience mouth abrasions or blisters. Clear braces are a great solution for both teenagers and adults. Traditional braces can correct the same dental conditions as Invisalign (as mentioned above). To straighten teeth with orthodontic braces, patients usually must undergo a longer treatment period, sometimes lasting up to 4 years. Patients must adhere to staying away from certain foods (popcorn, hard candy, etc), which can break the braces or brackets. Several follow-up appointments are needed to tighten or reposition the braces in order for your teeth to continually shift. Sometimes patients experience minor mouth abrasions or blisters from the brackets rubbing against the cheek area. There are several pros and cons when it comes to braces and Invisalign. Choosing one over the other is a decision not to be taken lightly. Your smile is a very important part of your overall appearance, and we want to create that beautiful smile you crave. Whether you choose traditional braces or clear braces, we are confident that you will love your brand new smile filled with straight teeth! Which is the Best Orthodontics Braces Option for You? Many of our patients know and understand why and how Invisalign trumps traditional braces! We will be more than happy to discuss these dentistry options with you. 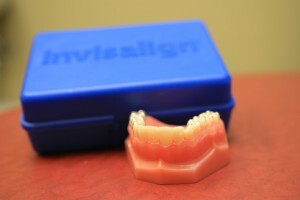 If you’d like, we can even show you before and after pictures of patients who straightened their teeth with Invisalign. As you can see, Invisalign offers advantages that traditional braces do not; however, they may not be right for everyone. Our cosmetic dentist invites Fairfax residents to come to our office for your complimentary consultation. We can help you determine which braces option is the best for you.